Many years ago the Eastern bluebird was one of North Carolina’s most common songbirds. However, factors including severe winters, other aggressive birds, and the destruction of bluebird habitats have resulted in the Eastern Bluebird population declining by as much as 90 percent. Even though the bluebird has made a strong comeback due largely to conservation efforts, the continuing loss of natural nesting sites and other problems bluebirds face indicate that this bird will always need man’s help to survive. The Bluebirders of Wake County, a club dedicated to bluebird conservation, shares some ways you can help local bluebirds. – Install a nest box with a 1½-inch entry hole. Bluebird boxes can be mounted on poles, fence posts, or trees. If you have the space, create a bluebird trail by placing a series of the boxes on your property spaced about 300 feet apart. – Monitor your nest boxes weekly, removing only starling and house sparrow nests. – Supply fresh clean water all year near the boxes. – Erect a bluebird feeder and fill it with sunflower heart chips, suet, raisins, and mealworms. – Plant berry producing trees, plants, and shrubs. – Tell your friends about the bluebirds’ plight and encourage them to help. The Bluebirders of Wake County was formed in 2006 and works to conserve bluebirds and other cavity nesting wild songbirds protected by the Migratory Bird Treaty Act. The group’s quarterly meetings, currently held in February, May, August, and November on the grounds of Raleigh’s Mordecai Historic Park, are free and open to the public. The club‘s founder and coordinator, Bill Satterwhite, is known as “The Bluebird Man” of Wake County. Bill has established many local bluebird trails and has a passion for bluebird education and preservation. Joye Stephenson is the club co-coordinator and Glenda Ryan is the webmaster. Bill and Joye are also the Wake County Coordinators of the North Carolina Bluebird Society. For bluebird questions or assistance, contact Bill at 919-787-5248 or Joye at 919-632-0736. 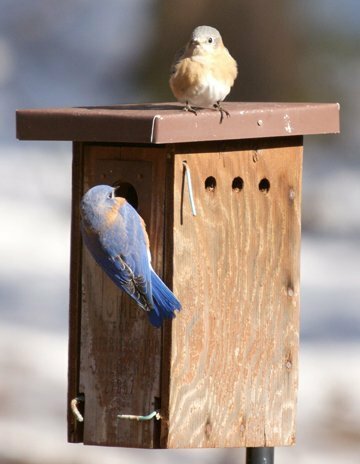 Additional information on nesting boxes, monitoring bluebirds and other tips is available on the web site of the North Carolina Bluebird Society.